Over the past decades a growing demand and interest has stimulated many researchers to investigate different aspects of steel plate shear walls (SPSWs). 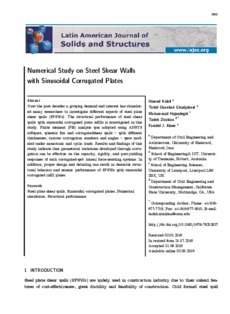 The structural performance of steel shear walls with sinusoidal corrugated plate infills is investigated in this study. Finite element (FE) analysis was adopted using ANSYS software, wherein flat and corrugatedshear walls - with different thicknesses, various corrugation numbers and angles - were modeled under monotonic and cyclic loads. Results and findings of this study indicate that geometrical variations developed through corrugation can be effective on the capacity, rigidity, and post-yielding responses of such corrugated-web lateral force-resisting systems. In addition, proper design and detailing can result in desirable structural behavior and seismic performance of SPSWs with sinusoidal corrugated infill plates.